How would you call the path in the picture below? Is there a difference between sentier, chemin and voie? Can I assume people would interchange both words like road and street in English? No, but I wouldn't necessarily interchange them in English either though. A street being only urban as far as I know. In France, that would be a route or a chemin. It is too flat to be a piste de ski (alpin) but it is following a piste de ski de fond (a.k.a nordique) that I initially failed to spot on the right side, thanks subsexdexter for opening my eyes! It looks too wide and leveled to be a sentier, which is normally a narrower track only convenient for pedestrians / animals, not for vehicles. A route is more likely to be surfaced while a chemin is usually unpaved, although the reality is not always that strict. Anyway, because of the snow, we do not know about the one in the picture but we would call it in France, le chemin qui longe la piste de ski de fond. Google maps later allowed me to locate the place where the picture was taken. There is a general difference in size and importance as far as French spoken in France is concerned: a "sentier" is the smallest of ways on land, used by people on foot or beasts of burden in the past, a "chemin" is a wider way and can be used by carts, and finally a "voie" is the biggest of ways as far as land goes, although the term can be applied much more generally than the other two. "Sentier" is used only for narrow footpaths in the country and in the woods or parks; in most cases it's a beaten earth path, but it can be covered in gravel, rock and earth in the mountains, and concrete in some park areas. It's the translation of "track" or "trail" essentially (sentier de forêt (forest track), sentier de montagne (mountain track)). For instance, the some 3500 km long Appalachian trail in the eastern United States will be called "le sentier des Appalaches". "Chemin" is the name for a way wider than a "sentier" as it can be used by carts and often cars but it is still a thoroughfare not usually found in city areas and it is most of the time simply beaten earth; it corresponds to american dirt roads, although those are often much wider. It's the translation of "lane" generally (chemin de campagne (country lane), un chemin forestier (a forest lane)). This word is sometimes found in the name of city streets in place of the word "rue"; often this is because an ancient country lane has become a normal street as time went by. "Voie" is a very general term used first to describe any city macadamized or cobbled thouroughfare and in the particularised context of motorways what is called a track or a lane. Much more generally it is used to refer to railway tracks (voie ferrée) , airways (voie aérienne), waterways (voie fluviale _ Le Rhin est une voie fluviale.). The way shown in the picture, which by the way is a refreshing winter sight in the FSE, should be called a "chemin" if found in a city park and if not macadamised. If it's covered in macadam, then, even if in a park, it is called usually "une route". Note: this answer applies to standard, European French - I am not sure if it would in the same way in Québec. A voie is a very broad generic term for a way or a lane that can be used by vehicles, no so much used in everyday life. Any rue or avenue can be labeled as a voie when it comes to describing it as a way where vehicles can drive. It is less common for pedestrian roads. It can also be used for tracks used by trains or tramways. The term is often used in rather technical or official contexts, such as the signs voie sans issue. A sentier is a narrow path, not large enough to be used by vehicles (or maybe just a bike). It typically goes through natural settings such as a wood or a forest and is usually not paved. A chemin is larger than a sentier: it can be large enough to be used by a vehicle. It can be paved or not. You can find chemins in parks, in woods, on the countryside - you would not find many houses along a chemin (or maybe just a farm or an isolated house) or then it would rather be a rue. 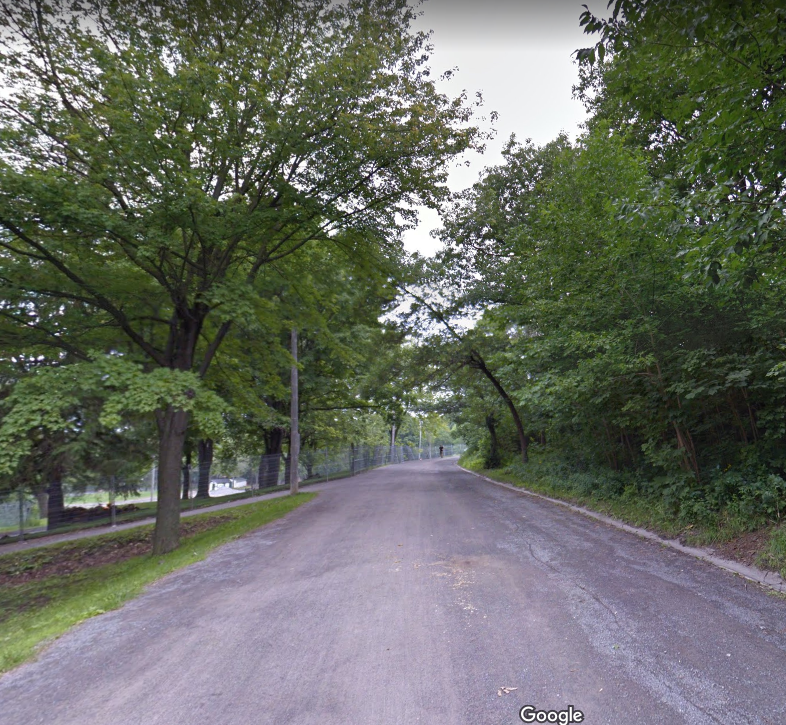 The path on the picture would rather be labeled as a chemin, or even as an allée, which is a pedestrian road in a park. Note that these are general usages, but you can come accross plenty of places where those labels were used for a certain road or path in the past and have been used in that same way even after heavy urbanization. I am thinking for instance of a large urban avenue in my own town named voie romaine, or a once rural, small road that has become a residential area with villas and houses but is still named Chemin des postes. En complément à une réponse en particulier. 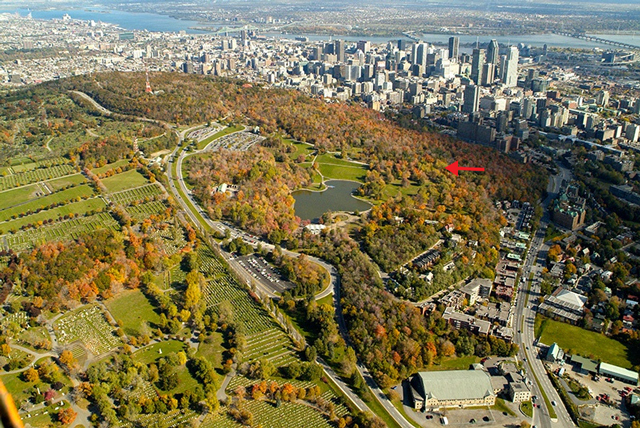 Le chemin Olmsted du parc du Mont-Royal (Wikipédia) est un odonyme (un « nom de lieu désignant une voie de communication routière, ferroviaire, cycliste, pédestre ou autre », GDT) désignant un sentier de marche/de randonnée (pédestre) à longueur d'année ou utilisé comme sentier de ski de fond/piste de ski de fond/sentier de randonnée à ski, l'hiver, voire un sentier de raquettes s'il servait cette fin etc. 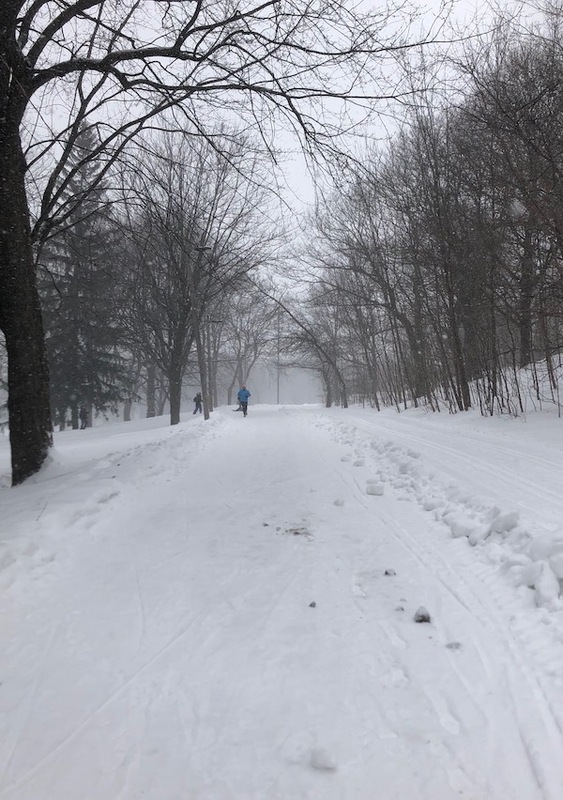 Est-ce à proprement parler un chemin, un sentier, une voie (pas celle à laquelle on réfère usuellement), une piste (l'hiver) : oui. Mais ce chemin n'est pas une rue (street), et c'est non carrossable ni même pavé ; en fait c'est recouvert de gravelle (gravier)... et ici de neige. (Source : Ville de Montréal, sur le site lemontroyal.qc.ca) Vue du site avec le Lac aux castors au centre, et une flèche pour indiquer très approximativement où l'on pourrait se trouver dans l'image en question ; voir autre réponse pour localisation géographique plus précise. Not the answer you're looking for? Browse other questions tagged vocabulaire québec france or ask your own question.